Outsourcing your social media is not a decision you should take lightly. For it to be done properly it needs planning, structure, targets and of course the right skills and experience to pull it all together. In an ideal world you’ll have the time and resource to spend managing your own social media for your business. After all, you know what’s happening and what you want to share. But in reality outsourcing your social media can be a great way to have a professional social media presence without having to worry about finding the time yourself, or learning the best practices. If you’re posting random stuff to Facebook once a week it’s just not going to do anything for your business I’m afraid. At JCF we outsource the things we’re not so good at or would rather not do because we can make more money elsewhere. I’m terrible with numbers so our accountant does EVERYTHING. It’s fair to say we’re in favour of sub-contracting work you don’t need to do. DON’T put your accounts in the hands of someone who won’t deliver. Part of social media management is offering rapid responses to questions or comments from your fans and followers. That means an hour or two at most during standard business hours. DON’T be fooled by companies who say that a couple of automated tweets a day will do – it’s SOCIAL media. The most important part is the conversations and the interactions. The audience will quickly be switched off by dull sales messages – and you’ll waste your money. DON’T choose someone who forgets about cultural nuances that are important to your customer, or worse – sends out inappropriate material. 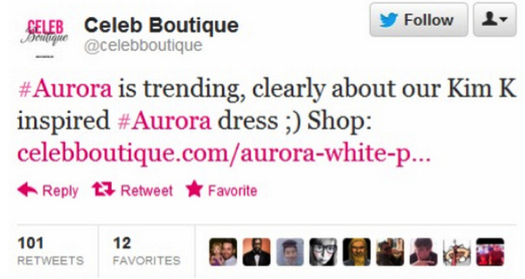 Clothing company Celeb Boutique posted this unfortunate tweet during the tragedy in Aurora simply because the #Aurora hashtag was trending. They later apologised for their oversight and insensitivity, but the damage had been done. Controversial tweets are often saved by shocked followers who see them, so deleting the posts won’t help. For another recent tweeting disaster just look at US Airlines (or don’t look, especially if you’re at work!). Recently they accidentally tweeted an extremely graphic photo in response to a customer question. An inexplicable crazy mix-up and the picture went viral on the internet in minutes. The US Airlines social media team didn’t even pull it down straight away! Your team has to be on the ball and aware of hot topics and breaking news. DON’T ask your friend’s sister’s cousin to use your social media channels because “she’s on the internet a lot anyway.” Social marketing is a vital part of your marketing and should be handled by qualified professionals with a proven track record of success. Your social media managers don’t just sit on Facebook all day watching cat videos! They should have a strategy which feeds in to your own plans for your business, and they should be able to focus on what you want to achieve online. DON’T choose the cheapest people who offer to do it for a bit of extra cash. You pay peanuts; you get monkeys. And monkeys haven’t developed proficient typing skills yet, in spite of having opposable thumbs. So assuming you can avoid the social media cowboys/monkeys, let’s talk about what you do need to look for…. Responsive – Are they available during the hours your target audience is online? It’s critical to respond to social media messages quickly so customers feel they’re being listened to. Make sure they have permission to answer basic questions on your behalf (maybe send them an FAQ sheet) to avoid wasting time getting responses vetted by lots of managers. Aware – Are they up to speed with all things digital? Do they understand your industry and business enough to interact with your audience? Can they walk the line between professional and engaging without being too boring or too cheeky? For most companies, family-friendly updates are the ideal – but your team should have experience in working within a variety of industries. Effective – Do they have a strong history of managing social media channels? Whether you’re looking to grow your followers on Facebook or encourage people to interact with your brand on Twitter, the most effective social media managers have experience of organically growing accounts, and know what it takes to help you reach your goal. Reliable – The best Twitter updates in the world won’t mean a thing if the people writing them are sporadic in their content placement or erratically available to monitor your accounts and interact with your audience. Effective social media management means constant vigilance and a willingness to move quickly. Professional and polite – You could have some fabulous content but if it’s not spelt correctly or has sloppy grammar this will reflect on your business and make you look incompetent. Try to find a reputable company who know how to use the English language. Outsourcing your social marketing frees you up to focus on the parts of your business you’re better at, while knowing your potential and existing customers are still getting the attention they deserve. If you’re looking for a company who can tick all your boxes, speak to us at Spaghetti about our social media management services.